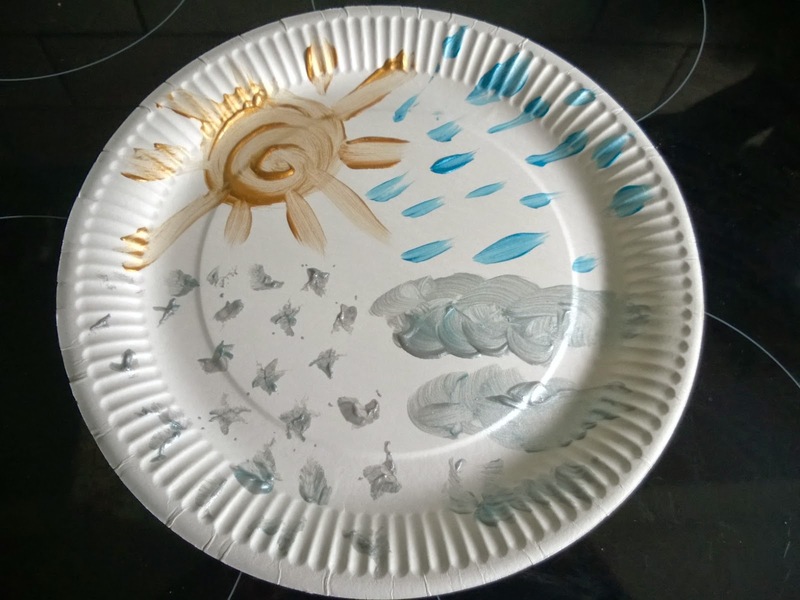 Changes from one season to the next make a great opportunity to introduce simple weather observations to young children. I chose just four weather types, but you could expand on this as you increase complexity. 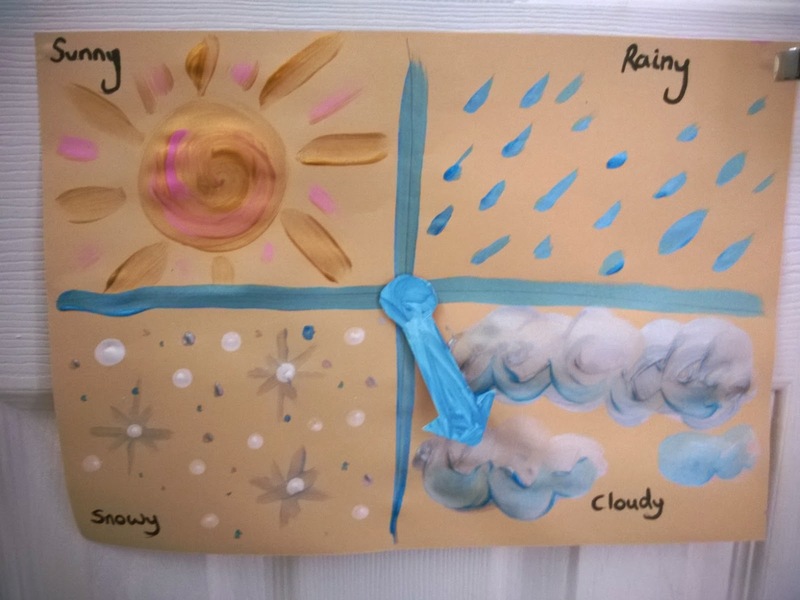 My aim for this activity is to get the kids used to thinking about what is happening in the world around them, so we pause for a moment before we head out of the door to look at what the weather is like. They can then start making decisions for themselves about what clothing and shoes are needed (if I think they have made a wrong decision I stuff the extra layers/ boots into a bag and take them with us). Having the chart builds littlest's vocabulary and adds to eldest's acquisition of sight words. I wasn't expecting the squabbling between the kids that resulted however as Ollie wanted to put the pointer on the actual weather while Toby kept putting it on the hoped for weather (always snow). The pointer is attached with bluetack, but one of those split pins that lets you twirl things round would be better if you have one. The chart is just paint on card, but it would benefit from being covered with sticky-back plastic to preserve it (mine is A3 so won't fit through my laminator). Toby wanted another chart for his play house, so I quickly knocked up another one using a paper plate. I also made a clock on a plate, with hands bluetacked on, for the playhouse. We're already getting questions from Ollie about why we have the weather we have, so in the new year we will start looking at the natural processes behind the weather, starting with rain and snow since he already is familiar with concepts such as evaporation, condensation and freezing. This was a little quick thing I knocked up, but an even better learning opportunity would be to help your little ones to craft their own. There's certainly no lack of changeable weather in the UK at the moment to inspire them, with warm sunshine one day and freezing cold sleet the next!